Single slice confocal images representing one optical slice of a cell stained for the Human Protein Atlas (HPA) antibody HPA006028 (shown in green). HPA006028 recognizes four and a half LIM domains and is shown here labeling the actin cytoskeleton and focal adhesions. The cells are also stained with reference markers in order to facilitate the annotation of the subcellular distribution of the protein targeted by the HPA antibody. 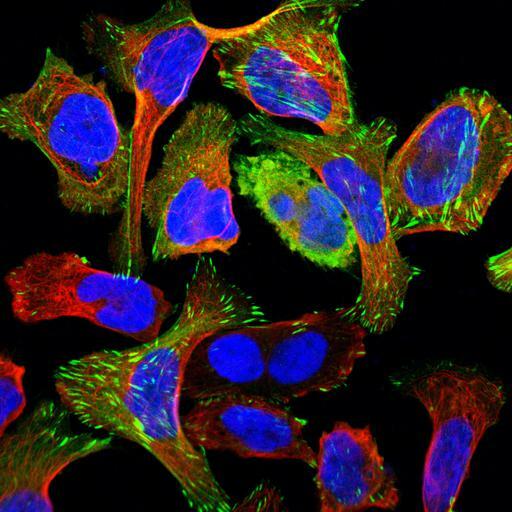 The following probes/organelles are used as references; (i) DAPI for the nucleus (blue), (ii) anti-tubulin antibody as internal control and marker of microtubules (red).